Arizona's state animal is the ringtail. Ringtails are 15-19 inches (39-46 cm) long. They live 16-19 years in the wild and 27 years if kept in zoos. 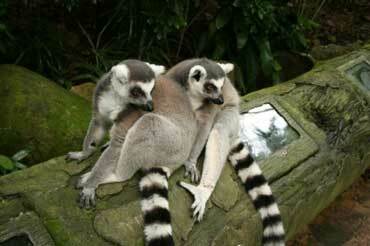 Ringtails have long, bushy tails with black and white stripes. Their tails are longer than their bodies. The Grand Canyon was created by water from the Colorado River. 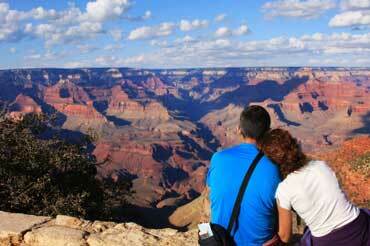 The canyon is 277 miles (446 km) long and a mile (1.83 km) deep. There are many Indian reservations in Arizona. 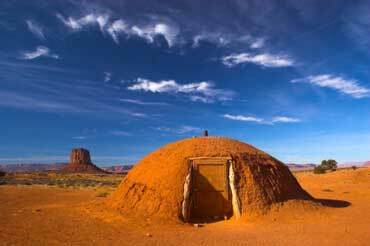 This is a Navajo indian house or a hogan. It is made from wood and red mud. The doorways of hogans always face the east so the sun can enter the house in the morning and bring good luck.